The Where’s Waldo on WordPress blog has posted the first part of a three-part interview Matt Hoos and I conducted with blogger Michael Liss last month about “Where’s Waldo” and even thought it was a three hour discussion about Waldo, he’s somehow managed to make us sound reasonably coherent. “Intrepid Waldo Blogger Michael Liss” came to Toronto to talk to the Waldo Ultimatum director Matt Hoos and I last month and we ended up having an epic conversation about the iconic traveller in the striped sweater. Seriously, we must have ended up talking for nearly three hours. About “Where’s Waldo”. 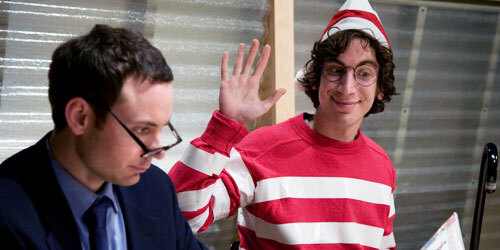 Matthew: I hadnâ€™t started thinking of Waldo again since my youth until we started this project. For me, the iconic status that this little man with glasses and a sweater has taken on is astounding. Everybody, everywhere knows who this guy is. He may go by different names in different parts of the world, but it seems to me that people of our generation, people of an older generation who read the books to us, and now kids who are being read the books by parents our age, all have this easy connection with this figure. He somehow managed to clench a spot in the collective consciousness. Brad: Waldo was the ultimate cipher when youâ€™re a kid. He was a perfect thing to base stories around, because youâ€™re never entirely sure where he is or why heâ€™s there, so you actually have to fill in his characterization and motivation yourself. Why is he at the fair ground, why is he at the airport? Why is he in these various locations, and why are these other little pantomimes playing out around him? So as a kid, part of the appeal is you have to create these stories for yourself to make him compelling and relevant to you. When you become older and come back to it, you can then make the cipher youâ€™ve created relevant again to the little, daily absurdities that youâ€™re dealing with. And thatâ€™s fun, because he speaks to everybody for very different reasons, but heâ€™s sort of a shared, storytelling creation kit. Michael’s done an amazing job of turning a very rambling conversation into something rambling, and given some of the odd turns the rest of the conversation I look forward to parts 2 and 3 whenever the poor guy gets done editing them.